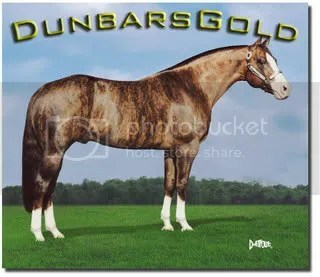 wow, I have never laid eyes on a horses this patterned in my life. How cool! 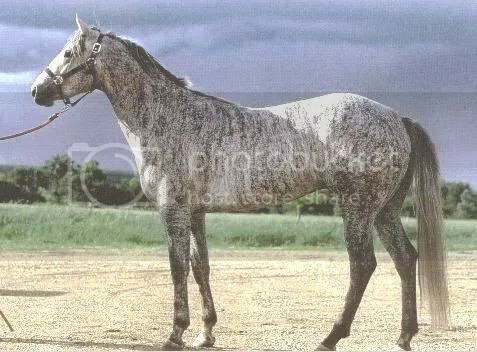 Brindle has always been my favorite colouration on dogs, but I had no idea there were brindle horses. How do the breed associations handle it? In my experience, anything they’ve not specifically included is out. I knew a gorgeous Thoroughbred mare who was tossed out, although there was zero question she was purebred. Still, she made a great Pinto. Wow, me either. I had never heard of such a thing, how amazing. I just learned something new!!! Thanks for stopping by my blog, Mustang ‘n’ Cowboys. I look forward to the ALL THINGS EQUINE CARNIVAL over at MiKael’s!! Well I have seen everything now. That is incredable. We breed paints and pintos and did not even know about brindles. Will definatly be reading more about them. Don–I haven’t heard of it cropping up in ponies, but you never know. I have never seen a horse of this colour and particularly like the first one. 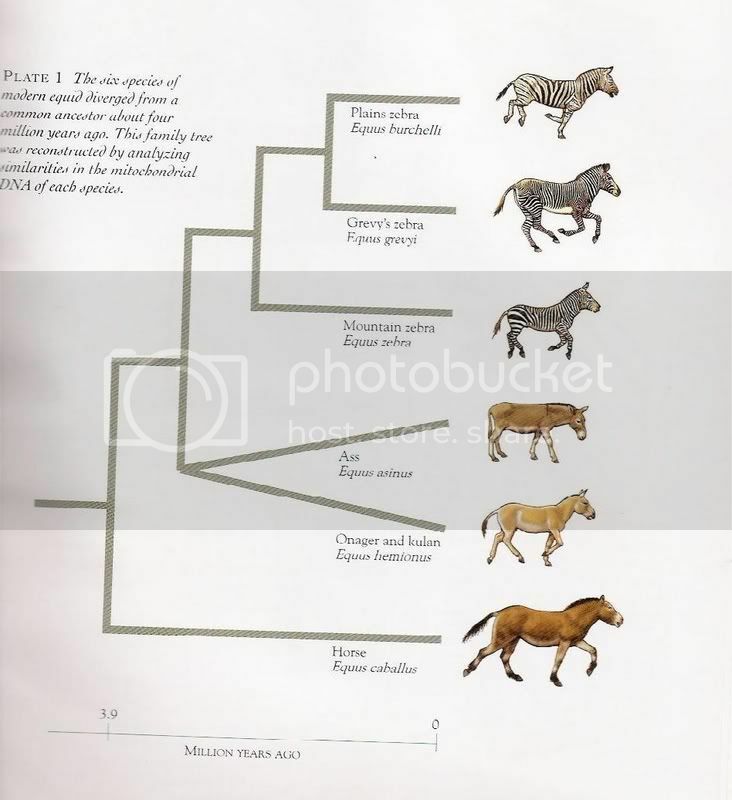 I have recently been reading a horse book, The Nature of Horses, which includes a section on colour genetics. I am still trying to understand some of the different variations including some I’d not heard of before. This did not mention brindle! This has obviously raised my interest in horse colours as I noticed an article on the UK’s first coloured thoroughbred foal. See the following website Horsetalk. Reckless Dan’s shoulder and front pasterns look a little too upright to me, but maybe it’s just the photo. Karen, is that the Budiansky book? It’s fantastic but his colour genetics are a bit out of date; there’s no “dominant white” gene, at least not the way he describes it. The most up-to-date info is actually online, as there have been a lot of research breakthroughs recently and publishing has such a long turnaround time that it doesn’t necessarily reflect current thinking. Even Sponenberg’s latest is a bit behind the times. Yes – I have been reading the Budiansky book but have found some different info on the web as you advised. It’s all pretty complicated. I agree with your comments about Reckless Dan’s conformation but really liked his unusual colouring. I have not read the books but the grey horse at the op of the page is GORGEOUS! If on your webpage you have linked to my AOL webpage (members.aol.com/brindlehos), I am sorry to say that AOL has cancelled their webpage services. I’ve had my page there for 11 + years with links to it from all over the world. I first heard about Brindles in a book called Riding Lessons. It’s a really good fiction novel, actually…. Anyway, I’ve loved these horses ever since and have dreamed of owning one for a long time. The purpose of this post is to inform you of the American Brindle Equine Association, a registry that has been formed to document, record, preserve, and promote the brindle characteristic in horses, donkeys, and mules. Horses, donkeys, and mules of all sizes are accepted by this registry including ponies and miniatures. No equine exhibiting zebra breeding will be registered with the ABEA, however chimeric and mosaic horses shall be accepted so long as they possess a brindle pattern. I have a dam seal brown horse, how could I breed her to get a brindal color? She has 4 white socks and white diamond on her head. I have try all things to find out how this could work. Please let me know if have any ideas! !